The fantasy quest, beginning with a youth, who has gifts and potential they have yet to master. Who is guided by an older mentor and forced from their home by a life changing event onto their journey and battle against evil foes that stand in the way of them reaching adulthood. On one level, this is the plot of Knight of Aslath. You can clearly see the interpretations of each archetype and concept in the story. Parallels to Tolkien’s Lord of the Rings often abound in this type of fantasy, specifically in the characters, but here they reveal themselves in the plotting as well, with the undertaken quest having similar moments of rest, deliberation and pause. The writing is well judged at times, particularly at the start. The character of Temaris is introduced and established through his actions which hint at a complex past. However, Ethné the young female lead is less well drawn. Lapses in conversation topics, period clothes and more raise an unintended smile. This weak sketch serves to undermine the developing plot as Foley seems to be trying too hard to write a female character, rather than write a character. As it progresses, Knight of Aslath feels dated. The emerging binary of good’s struggle against evil sets the writing before the lessons other writers learned from George R. R. Martin’s Game of Thrones. This means the attempts to make characters ambiguous are more transparent than they might have been. The story harks back to earlier eighties fantasy in its feel. This might not be too much of an issue, as these stories are still very popular, but the portrayal of some female characters and the invoked comparison to Tolkien in the first half does not help matters. There is also the lack of depth to Foley’s societies and civilisations. Knights, mercenaries, merchants and nobles of court are all very well, but the bedrock on which they are built are peasants and common folk. Often the economics don’t seem to be thought through, particularly when Temaris’ mercenary companions receive titles and great tracts of land for their service to the kingdom of Arkavia. Where did these baronies come from to be granted with a stroke? The story of the family evicted by such a whim might be one worth telling. However, as the book moves on and introduces layers of politics we start to question who our heroes might trust. Here, Foley juggles a complex web of schemes alongside the coming of age narrative. The second half improves marginally and we begin to see the unique craft of his storytelling. 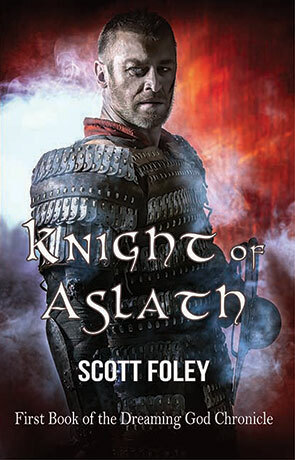 Knight of Aslath is a diverting read and pleasant enough if the character problems can be ignored. The components of a traditional fantasy quest still draw a good audience and those seeking it, shouldn’t finish the book feeling disappointed by what they get. Foley has plainly put a lot of work into this and there are enough signs to suggest he will grow from this first book to develop a good series. Written on 8th July 2015 by Allen Stroud.